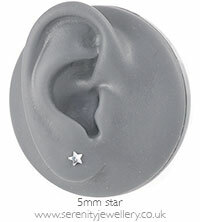 Hypoallergenic Blomdahl silver titanium 5mm or 8mm star stud earrings with titanium butterfly backs. 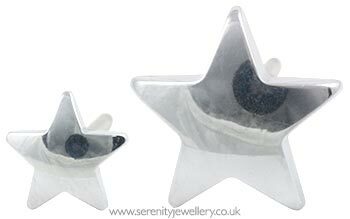 Pretty and discreet little star earrings - really comfortable, no irritation at all. And best of all the right length post so as not to cause problems when sleeping. Thoroughly recommend. I bought them in the 5mm size for my daughter, and she really loves them. She can even keep them in during sports and gym class, that is super practical. great for everyday. These are even cuter than they are in the pictures! The 5mm size is just right! They are just adorable and I love wearing them a lot! They get a lot of compliments! These are really pretty earrings. I bought them for my daughter as she has newly pierced ears and I wanted her to wear a decent pair of earrings when we removed the piercing studs. These fit the bill, although she hadn't worn them yet. Love, love, love these. Just chunky enough to look slightly edgy rather than little girly-girly. They are my new favourites. 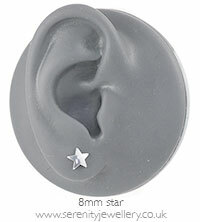 These are great follow on earrings for my daughter who had her ears pierced a few months ago. Her ears had healed ok but were still prone to a bit of inflammation - this seems to have stopped since she's been wearing her titanium earrings. The other good thing is that the earrings and backs are not too small and fiddly so it's easy for her to get them in and out. delivery was very prompt too. All in all, a good earring experience! Bought these earrings for daughter, who is thrilled with them. Good size (not too big) so she can wear them to school.